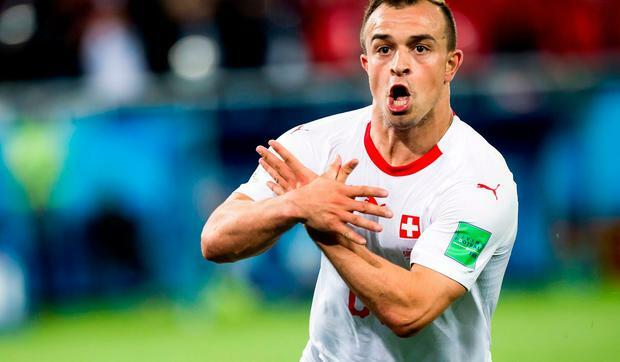 Serbia want Granit Xhaka and Xherdan Shaqiri punished for their Albanian eagle salutes in the country’s defeat in their World Cup grudge match with Switzerland. The Football Association of Serbia (FSS) also announced it would complain to Fifa about Shaqiri’s boots - which bears the flag of Kosovo - and the display of “several controversial flags” during Friday night’s dramatic Group E game in Kaliningrad. And the FSS was lodging an official protest as well about the non-award of a second-half penalty to Aleksandar Mitrovic after the Newcastle United striker was hauled to the ground by two Switzerland defenders. FSS secretary general Jovan Šurbatović said: “We think we were roughly injured in the 66th minute and we're sure to file a Fifa appeal. “But that controversial detail in the 66th minute is not the only reason we will write Fifa. Xhaka, whose family was forced to flee the Balkans after his father was jailed for campaigning for Kosovan independence, and Shaqiri, who was born in the former Serbian province, paid tribute to their roots after scoring on Friday. Given both Albania and Kosovo are members of Fifa and their flags displayed at international matches, it appeared unlikely Xhaka and Shaqiri could be charged with breaching its rules on the display of political symbols. But Article 54 of its disciplinary code does outlaw what is defined as “provoking the general public”, an offence that carries a two-match ban. Stoke City winger Shaqiri admitted afterwards he was overtaken by “emotion” after his stoppage-time winner sparked wild celebrations. Arsenal midfielder Xhaka was unrepentant about his own salute against opponents whose fans jeered Switzerland’s Balkan-blooded players throughout Friday’s game and whose government refuses to recognise Kosovo as an independent state. “Frankly, my opponents did not interest me at all,” said Xhaka, whose brother, Taulant, plays for Albania. His manager, Sarajevo-born Vladimir Petkovic, was less than impressed after the game, having repeatedly said before Friday’s grudge match that football and politics should not mix. Petkovic’s players apparently agreed not to perform the salute while on Switzerland duty following a discussion about it when he took charge four years ago. Fifa, which the Sunday Telegraph has contacted for comment, had already cleared Shaqiri to wear boots bearing the flag of another member association. FSS vice-president Savo Milosevic, the former Aston Villa striker, confirmed the complaint about the penalty decision - which was not disputed by the Video Assistant Referee - had been lodged. “We filed an official complaint and a protest to Fifa,” he said after a defeat which left his country realistically needing to beat Brazil in their final group game to reach the last 16. “We have experienced the same thing in two matches. Against Costa Rica, VAR has not been called. This time, a more scandalous decision. The ref even gave a foul against us. “Why did we introduce this VAR? They have the opportunity to review the video for five, 10 times.